For the past several years, we have been working towards providing our students with more opportunities to take risks in a safe and controlled environment by expanding the choices for students as well as adjusting our supervision philosophy and approach. Our shift away from ‘safe as possible’ to ‘safe as necessary’ on our playground has allowed us to provide a much more rich, recess experience for our students. Building, climbing, game development, balancing and designing are all possible during our recesses. 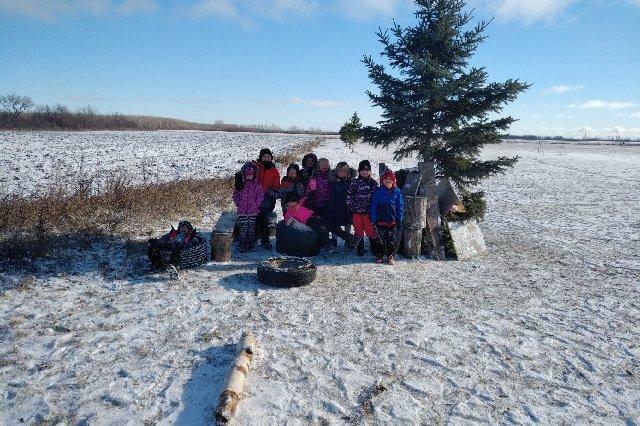 Students are regularly engaged in imaginative play as well as problem-solving when loose parts materials (logs, stumps, tires, bales, construction lumber) are used in our playground. The students keep surprising us with their ingenuity: rolling inside tires, building a ‘race car’, Parkour, obstacle courses, log teeter-totters, ‘snow-boarding’ on a 2x4... the possibilities are endless when students are given opportunities to explore and take risks. When conflicts arise regarding the use of the loose-play parts, our adults work together with the students to help them problem-solve on their own (as appropriate) instead of solving all the problems for them. These conversations ensure students are heard and are part of the decision-making process. This has led to stronger relationships among everyone at Gillis School. While we don’t have hard data (yet), our anecdotal data suggests that the problem-solving, cooperation and risk-taking that students have been engaging in at recess has translated into better achievement when they are faced with difficult academic challenges in the classroom.